It starts with a single lesion. And then another. Soon, the snake’s entire body is covered in the unsightly sores. If the snake is lucky, its skin will start molting, expunging the reptile of the infection. Less fortunate snakes will die. And in some cases, desperate snakes will spend more time in the sun to expedite the molting process—a risky move that makes them vulnerable to predators. This awful fungal infection is caused by a pathogen called Ophidiomyces ophidiodiicola, and it’s starting to make scientists quite nervous. As a new study published in Scientific Advances points out, this infectious disease, which is known to afflict a handful of snake species in the United States and Europe, could soon reach global, pandemic proportions. A team of scientists from the American Museum of Natural History, the US Geological Survey, and the University of Maryland, College Park, say snake fungal disease (SFD) can infect many species of snake regardless of genetic predispositions, physical characteristics, or habitat (this fungus doesn’t harm humans, in case you’re wondering). Disturbingly, virtually every snake on the planet is at risk—and the call is now out for scientists to be on the look-out for this emerging threat. Frank Burbrink, an associate curator in the AMNH’s Department of Herpetology and the lead author of the new study, didn’t mince words in a published statement. 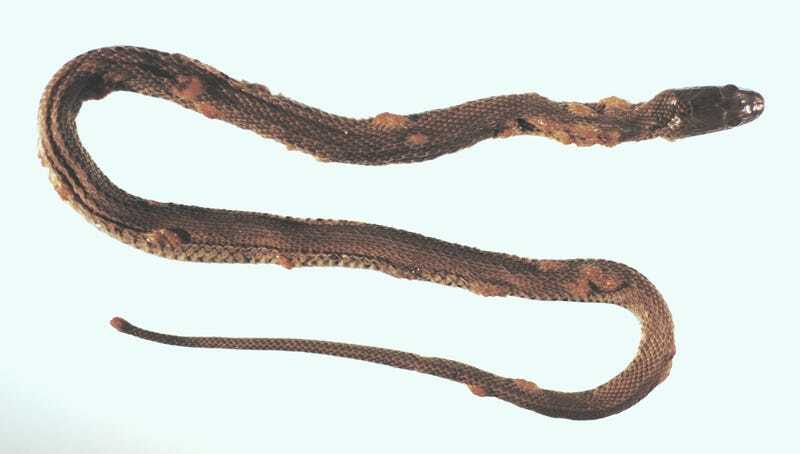 O. ophidiodiicola only infects snakes, and it causes skin swelling, crusts, and nodules of the skin. It’s often fatal. Scientists aren’t sure how it’s transmitted, but it may spread from snake-to-snake after they rub against each other, or when they slither through a contaminated environment. In the United States, this disease is known to afflict 23 different species in the wild, most especially rat snakes, milk snakes, and garter snakes. The disease is most prominent in the eastern parts of the U.S., where it’s already causing population declines. As the new study points out, the disease has now spread to Europe, where it’s affecting three different species. It’s very difficult at the moment to predict the scope and spread of SFD, so the research team turned to a neural network for help. The artificially intelligent system was fed genetic data about the snakes, information about each snake’s physical characteristics, and other measures. As the authors write in their study, results showed that “SFD hosts are both phylogenetically and ecologically randomly dispersed,” meaning the disease affects snakes regardless of their ancestry or location. This suggests that all 98 species of snakes in the U.S. are potentially at risk, and that the epidemic could go global. The model is not perfect—it’s only as good as the data that’s put into it—but the result is alarming nonetheless, and a sure sign that more work needs to be done in this area. Indeed, this finding is particularly upsetting given how bad fungal infections are known to be. For example, there’s white-nose syndrome in bats and chytridiomycosis in amphibians. In the case of bats, white-nose syndrome has spread from coast-to-coast in the U.S. At least four species have suffered massive population declines, including one that may eventually become extinct. Part of the reason why fungal diseases are so nasty is that they’re capable of infecting multiple species, as is the case with O. ophidiodiicola and snakes. Because losing lots of snakes would be bad for the whole environment. Sure, they can make us squeamish, but they fill an important ecological role.